Adam Watson, as most of our readers will know, is a renowned ecologist and authority on the Cairngorms. His fascination with winter snow and with snow patches dates back to the late 1930s. lain Cameron grew up in Renfrewshire and, although he now lives in South-East England, he devotes many summer and autumn weekends to researching snow patches in the Scottish Highlands. Since 2007, the two have coauthored the annual snow-patch paper in the Royal Meteorological Society journal Weather. 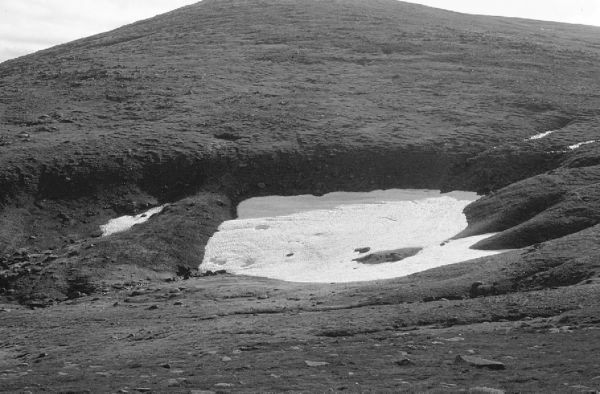 Cool Britannia is a review of the evidence from contemporary writers of snow conditions in Scotland, England and Wales over the last four hundred years. Not surprisingly, the bulk of the evidence relates to the Scottish Highlands but other upland and lowland areas are also considered. The picture the authors draw supports the existence of a colder, snowier climate up till the first few decades of the twentieth century than we have experienced since. The book is arranged by area e.g. Ben Nevis, Cairngorms, Lochnagar and Angus, Glen Aifric, etc. Naturally, some areas area better covered than others. 'The Cairngorms' have the longest chapter while 'Ben Nevis' is also well covered. 'Perthshire hills' on the other hand, is only a very short entry, as is 'The Drumochter hills and Ben Alder range'. This of course illustrates the relative richness, or otherwise, of available material on the different areas. Coverage also extends to Lowland Scotland, Northern England, the Peak District and Wales. Appendices deal with related topics as tradition of Highland landowners having to produce snow as a condition of holding their lands and the remarkable story of Elizabeth Woodcock, who in Feb 1799, survived being buried in a snowdrift for 8 days near lmpington in Cambridgeshire. Cool Britannia draws on a vast range of published materials dating back to such early writers as John Taylor, the so-called water-poet, who visited Atholl, Braemar and the Cairn o'Mount around 1610, Daniel Defoe, Boswell, Pennant and other early travellers as well as the Old and New Statistical Accounts of Scotland. Sources become more plentiful as we move into the 1gth century and the era of modern mountaineering and hill-going. The extensive bibliography provides a mine of possibilities for anyone who wants to take their interest further. The text combines extensive quotations, italicised, with the authors interpretations and comments and is well illustrated by frequent photographs of mountains, hills and persistent snow patches. With a page size of near A4 and a generous font size, Cool Britannia is attractively presented and easy to read  assuming a degree of interest in the subject matter. I would recommend it to anyone who finds snow as fascinating as the authors (and this reviewer) do.